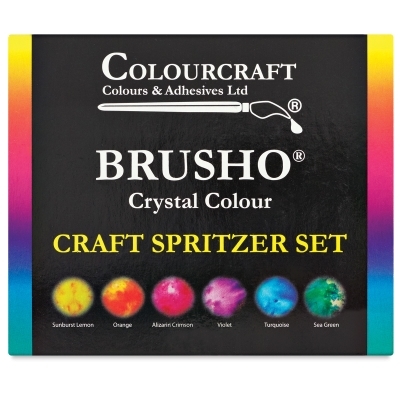 Brusho Crystal Colours are amazingly versatile watercolor ink crystals that can be used in a myriad of different ways. Incredibly vivid, vibrant, and brilliant, they open up a world of possibilities for painters, mixed media artists, and crafters of every level, from student to professional. Totally intermixable, Brusho Crystal Colours can be used on paper, canvas, or even wood. Sprinkle them directly on a wet substrate and watch intriguing organic patterns appear almost like magic. Or sprinkle Brusho Colours on a wet brush, painting knife, or texture tool to create a variety of gorgeous effects. You can dissolve them in water and apply them with a spray bottle, or add them to wax paste or gel mediums for body. The instructional leaflet shows you all the basics and is sure to fuel your drive to experiment. 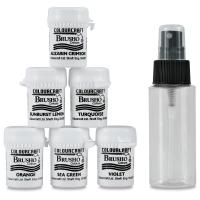 Manufactured in Sheffield, England, for more than 35 years, Brusho Crystal Colours are completely non-toxic and non-hazardous. Wear rubber gloves to protect your skin from staining. Craft Spritzer Set — Ideal for card making and other crafts, this set includes six 15 gram pots Brusho Crystals (Sunburst Lemon, Orange, Alizarin Crimson, Violet, Turquoise, and Sea Green), plus a spritzer bottle for creating bursts of vibrant background color. Assorted Set of 8 — This basic introductory set contains Yellow Ochre, Rose Red, Lime Green, Olive Green, Moss Green, Sandstone, Terracotta, and Burnt Sienna in 15 g pots, plus an instructional leaflet. Assorted Set of 12 — This broader range of 12 colors includes Lemon, Yellow, Orange, Scarlet, Brilliant Red, Purple, Ultramarine, Leaf Green, Emerald Green, Turquoise, Dark Brown, and Black in 15 g pots, along with an instructional leaflet. Assorted Set of 24 — This complete set of 24, 15 g colors includes Lemon, Yellow, Gamboge, Orange, Vermilion, Scarlet, Brilliant Red, Ostwald Red, Crimson, Cobalt Blue, Ostwald Blue, Ultramarine, Prussian Blue, Turquoise, Leaf Green, Emerald Green, Sea Green, Violet, Purple, Light Brown, Dark Brown, Grey, Black, and White, plus an instructional leaflet. ® Brusho is a registered trademark.